Today might have started as a big day for Thor: Ragnarok, but don’t sleep on Black Panther, another much-anticipated Marvel release. T’Challa and his crew have some news, too, and it comes from the most likely of sources ever: the toys. Yahoo Movies posted the first toys revealed from the Ryan Coogler film, and while they’re all cool, we’d like to highlight three which seem to reveal a few major things about the movie. Now, it’s important to remember that just because something is incorporated into a toy doesn’t necessarily mean it’s in the movie. But we have a good feeling about these. The biggest reveal feels like this one. That’s Michael B. Jordan’s character, Erik Killmonger, in his own version of the Black Panther suit; it’s got a slightly different design, and a much more menacing face mask. It’s first time we’ve seen something like this on the character, at least in the movie. 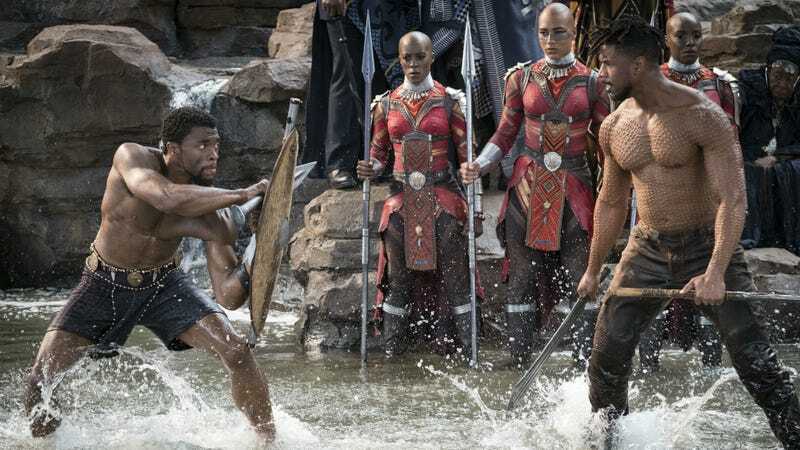 In the comics, Killmonger has worn a Black Panther suit, but nothing like this, which is so obviously a kind of evil version of T’Challa’s outfit. Also, Comic-Con audiences got a glimpse of this suit in the trailer that played there, but now everyone can see it. Killmonger will almost certainly be using this suit to challenge T’Challa for the throne of Wakanda. This next reveal is a little less surprising, but still very cool. That is an upgraded version of the Panther costume T’Challa wore in Civil War. That suit didn’t have these blue vibranium highlights—but, in a country as advanced as Wakanda, a new suit is most likely a pretty common occurrence. Now, we don’t know for sure if this is in the movie, but Yahoo says it’s “inspired by the film,” so it seems likely. (We’ve contacted Disney for clarification and will update if we get it.) Whether it is or not, though, there’s no denying how insanely cool this is. Everything about Black Panther already looked great, but add a jet that TRANSFORMS into a robot panther on top? Come on now. This “Panther Jet,” as it’s being called, apparently does have some basis in the comics. It looks very much like the Prowlers, seen below. They’re basically Wakandan cat AT-ATs. CAT-CATS, kind of. Marvel Comics. Black Panther #27 Art by Sal Velluto, Bob Almond, and Steve Oliff. Head to the below link for more toys, including some cool weapons as well as a great look at T’Challa’s sister Shuri. Black Panther opens February 16.